LA Animal Services is striving to make further advancement toward our No-Kill Goal, a goal we define as our being able to use the same criteria a compassionate veterinarian or a loving pet guardian uses when determining if/when an animal is to be euthanized. In other words, no animal would be euthanized or killed because of a lack of space, time or resources and only irremediably suffering and dangerously aggressive animals would be euthanized. Over the past several years, the City of Los Angeles has demonstrated one of the nation’s steepest declines in dog and cat euthanasia. The dog and cat kill rate fell over 17% in 2002, over 10% in 2003, over 17% again in 2004, over 11% in 2005, over 6% in 2006, and an unprecedented 22% in 2007. According to the industry standard for calculating a community’s euthanasia rate, in the year 2007 the City of Los Angeles euthanized 4.3 dogs or cats for every 1,000 human residents. This is one of the lowest euthanasia rates of any community in the United States with the exception of San Francisco, New York City, and a couple of smaller communities. In the drive to achieve No-Kill there are two commonly recognized hurdles to clear. A community’s progress towards No-Kill will usually stall at the first hurdle which is typically found when its pet euthanasia rate is reduced to between 12 and 10 shelter killings per 1,000 human residents annually (12.5 is the current national average). Once a community achieves this rate, further significant reductions are stalled until the community decides to implement aggressive spay/neuter programs to achieve further euthanasia reduction goals. With effective, targeted spay/neuter programs progress to the second hurdle can be steady. This has been the case in the City of Los Angeles. The first hurdle becomes apparent after a community has successfully persuaded all the people who are likely to fix their pets to do so. The challenge then is to persuade the more difficult populations, which include the poor, the elderly on fixed income, individuals with negative attitudes about spay/neuter, people who speak languages other than English, and those who live in relatively remote areas. To break through the first barrier, the City passed a differential licensing ordinance to provide an incentive and LA Animal Services developed free and low-cost spay/neuter programs for our community’s needy pet guardians, and free spay/neuter for the pets of our low income senior citizens and disabled residents, as well as cat specific spay/neuter programs. These programs account for well over 40,000 spay/neuter surgeries annually. We have two spay/neuter clinics in operation today and five new clinics coming on line in the coming months. In addition, the City of Los Angeles recently enacted a spay/neuter ordinance that requires all dogs and cats to be spayed or neutered unless they qualify for an exception. Animal People magazine conducted a survey in 1994 that found transportation problems represent 40% of the total reasons why pets are not fixed, equal to monetary considerations. This data suggests that providing spay/neuter transportation or mobile spay/neuter clinics can play an important role in a community’s breaking through the 10 shelter killings per 1,000 humans barrier. LA Animal Services used this data to provide over 12,000 mobile spay/neuter surgeries annually throughout the City’s underserved areas by partnering with the Amanda and Sam Simon Foundations, along with the Coalition for Pets and Public Safety and others since the program’s inception several years ago. The second hurdle in the drive to achieve No-Kill has been characterized as “the wall”. Few communities have been able to break through “the wall”. A community hits “the wall” when it reduces its pet euthanasia rate to between 5 and 2.5 shelter killings per 1,000 human residents annually (LA City further reduced its euthanasia rate to 4.0 as of December 31, 2007). Hitting “the wall” tells a community it has come to the point where most of the animals dying in its shelters are irremediably suffering due to sickness or injury, demonstrate dangerously aggressive behavior, or are feral or neonate cats, or pit bulls. Hitting “the wall” signifies the success of an earlier generation of effectively targeted programs. To break through “the wall” requires a new generation of programs to address the needs of special populations not met by earlier programs. The paradigm remains the same: comprehensive data collection, assessment, and implementation of programs targeted to meet the special needs of residual populations. Finding more creative and effective ways to reach out to the public and market the adoption of hard-to-place pets becomes an even greater priority, and keeping the spay/neuter programs humming along remains paramount. Breaking through “the wall” requires taking the information-based targeting approach to the next level. As a result, LA Animal Services is focusing its efforts on saving at-risk animal populations on a community by community basis. To do this more effectively, LA Animal Services is expanding its monthly reports to show the adoption, New Hope, redemption, died, and euthanized rates in each of its Animal Care Centers. It is our hope that anyone interested in helping LA achieve its No-Kill Goal will have sufficient data to help us identify the problem areas and assist in developing meaningful programs. LA Animal Services is committed to continuing the positive trends of recent years and doing even better in 2008 and beyond, and we recognize we need everyone’s help to do that. More information on how more individuals, groups, and communities can be involved in finding solutions will be coming soon. Achieving No-Kill is not an easy undertaking. Everyday something seems to happen that could side track us from this goal. But LAAS has to be an organization that can walk and chew gum at the same time. We have to be both tactical and strategic. As we deal with each daily “crisis” it is important we not lose sight of our efforts to achieve our strategic No-Kill goal. As we progress, we will transition more and more from crisis management to managing and solving the problems resulting from pet overpopulation and irresponsible pet owner/guardianship, the problems that prevent us from achieving No-Kill immediately. So, is No-Kill even achievable? Well, the evidence suggests LAAS is at least moving in the right direction. During the first quarter of 2006 Dog and Cat Adoptions were up 9.36% compared to the first quarter of 2005. That represents 3,248 dogs and cats placed into loving homes in three months. That is the highest first quarter adoption rate in five years. Dog and Cat Euthanasia was down 37.31% compared to the same quarter last year. That represents 2,091 euthanasias. Still too many, to be sure, but it still represents the lowest quarter ever. 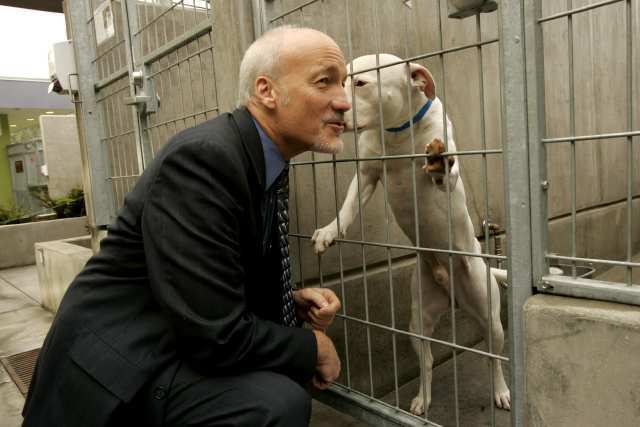 In fact, LAAS had three record low euthanasia rate months in a row, compared both with the last twelve months and when comparing January, February, and March 06 to the same three months in any other year (http://www.laanimalservices.com/Statistics.htm). Big Fix: Part of this success is certainly due to our community’s aggressive spay/neuter programs, including Los Angeles Animal Services’ Big Fix programs (a “branding” developed by Best Friends Animal Sanctuary and used by LAAS with their permission) (http://www.laanimalservices.com/bigfixspayneuter.htm). As a result of all our spay/neuter efforts, Dog and Cat Intakes were down 13.60% during this past quarter compared to the same quarter last year! LAAS has experienced a 24% decrease in intakes over the past five years. This is due largely because of The Big Fix Spay/Neuter Voucher Program for dogs and cats. LAAS shows a 35% increase in spay/neuter coupon redemption during Fiscal Year 05/06 so far compared to the first three quarters of Fiscal Year 04/05. We also see a 50% increase in Operation FELIX Voucher redemptions (for feral cats) during the first three quarters of Fiscal Year 05/06 compared to the first three quarters of Fiscal Year 04/05 (July – March respectively). Also, we can’t thank the Amanda Foundation and the Sam Simon Foundation enough for the incredible work they do to bring spay/neuter services into our neediest communities. The thousands of surgeries they and their predecessors have done in mobile clinics over the last several years have made an important contribution to the declining intake and kill rates. Plus One/Minus One: Another reason for the lower euthanasia rate this past quarter is a new program called Plus One/Minus One. This program compares the adoptions and euthanasia rates of dogs and cats on a day-to-day basis to last year. Comparing the first Monday of March 05 to the first Monday of March 06, etc. Seniors for Seniors Program: This program was implemented on February 1st, helping to improve adoptions by placing senior animals with our community’s senior citizens. To date over 100 animals have been placed through this important program. Mobile Pet Adoptions: LAAS also doubled its off-site adoption and special event efforts during this last quarter, resulting in 661 adoptions compared to 224 in the same time frame last year and 29 off-site events this year compared to 15 last year. And we are looking to increase our efforts even further! Keeping our eye on the ball is so very important. Will LAAS continue to be challenged with our own shortcomings? Indeed, we see that every day. People may become frustrated with what they perceive to be the slowness of our progress. But it took LA a long time to get into its current situation and it will take some time to turn it around. But we are turning it around. Over the past five years LAAS reduced dog and cat euthanasia 45.7%. LAAS significantly reduced dog and cat euthanasia every year since 2002 (17.7%); 2003 (10.3%); 2004 (17.3%); and 2005 (11.1%). And with a 35% decrease in the first quarter of 06, I’m hoping this demonstrates we are doing everything we can to step up the pace. But make no mistake, LAAS cannot do this alone. We need your help. If you would like to help LAAS and its many partners and friends make Los Angeles a No-Kill City I encourage you to consider volunteering to help our Foster Program or our Mobile Adoption Program. Donations to our Big Fix and other programs are also greatly appreciated. Together we can make LA the safest city in the United States for our pets.